Liz and Steve offer a warm welcome to Farfields Farm Bed & Breakfast. 3 generations of their family have farmed this peacefully situated working farm, overlooking the beautiful Newton dale Valley just 4 miles from Pickering and 1 mile from Dalby Forest. Farfields Farm offers 4 ground floor barn annexes, each with very spacious accommodation. There is much to see and do in the National Park - here are some ideas: Ride the North York Moors Railway. Visit Dalby Forest with excellent walks and cycle trails. Walk the Cleveland Way with glorious views of the Yorkshire Heritage Coast. Enjoy the historic fishing port of Whitby, just 16 miles away or a day trip to Castle Howard, and the attractions of historic York. 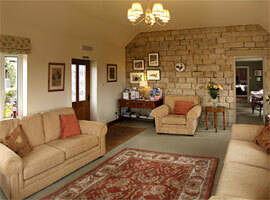 Visit Nunnington Hall, Rievaulx Terrace or the National Trust attractions of Bridestones and Blakey Topping. 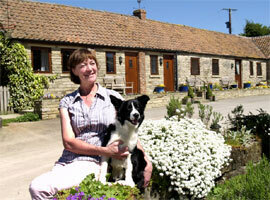 Farfields Farm B&B Accommodation: 4 warm and comfortable ground floor barn annexes. Each spacious annexe can be made up as a super king or twin beds. They have easy chairs, a flat screen TV with Freeview as well as a fridge, microwave, tea, coffee and hot chocolate making facilities. The large en-suite shower rooms have many added extras to make your stay comfortable and the residents lounge in the farmhouse offers books and leaflets about the area. The Fox & Rabbit Inn serving excellent meals and fine ales is only a 10 minute stroll from the farm.